No people will be on board for the test, just a dummy whose name, "despite popular belief... is not Buster," the California-based firm said. The launch could take place as early as 9:00 am Wednesday (1300 GMT) from Cape Canaveral, Florida, and the window of opportunity extends until 2:30 pm. Weather conditions are 70 percent favorable for take-off, NASA said. The entire flight test will be over in less than two minutes, with the spacecraft hitting a height of 5,000 feet (1,500 meters), then jettisoning its trunk before falling into the Atlantic Ocean about 1.4 miles away from the launch pad. The Dragon will not blast off atop a Falcon 9 rocket for the test but will instead get lift with the help of "eight SuperDraco rocket engines built into the walls of the Crew Dragon spacecraft," the company said. "This system is designed to quickly get the crew and spacecraft away from the rocket in the event of a potential failure," it said. "It is similar to an ejection seat for a fighter pilot, but instead of ejecting the pilot out of the spacecraft, the entire spacecraft is 'ejected' away from the launch vehicle." SpaceX says its Dragon crew vehicle is designed to allow astronauts to escape "from the launch pad all the way to orbit." Eject-capability has been a feature of other space capsules built by Russia, as well as by the US Mercury and Apollo missions, but those systems would only work shortly after launch. The US-made space shuttles were not designed to have an escape option for astronauts in flight. Seven people on board were killed when the Challenger exploded after launch in 1986 and another seven when the shuttle Columbia disintegrated on re-entry in 2003. The space shuttle program was retired in 2011 after three decades. Since then, the world's spacefarers have had to rely on Russia's Soyuz capsules at a price of $71 million per seat. 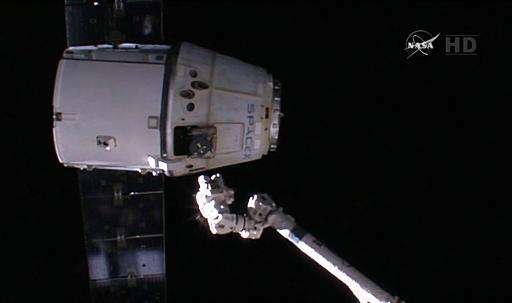 The first manned flight of the Dragon crew capsule is targeted for 2017. Already, a cargo-only version of the space capsule makes regular supply journeys to and from the International Space Station.